Electronic ebook edition. Optum 360's new companion resource to the ICD-10-CM code set. Learn to improve your diagnosis coding with examples and case studies, illustrations, decision trees, and other coding tools. 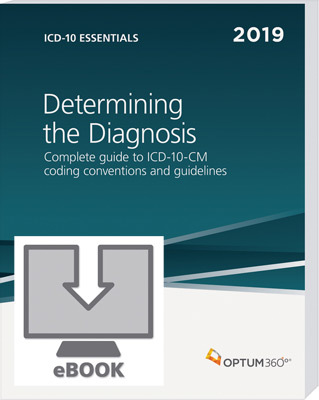 A complete guide to ICD-10-CM coding conventions and guidelines. ICD-10 Essentials: Determining the Diagnosis is a companion resource for ICD-10-CM that provides in-depth explanations of everything from the basic format and structure of the ICD-10-CM code set to appropriate application of the coding conventions and guidelines to coding of complex conditions requiring multiple codes with specific sequencing requirements. Using coding examples and case studies, correct code assignment is explained with an emphasis on application of the coding and reporting guidelines. Illustrations, decision trees, and other coding tools designed to enhance understanding of ICD-10-CM and improve coding accuracy are key features in this reference. Optum360 Edge — Hundreds of coding examples/case studies. Examples and case studies illustrating application of each ICD-10-CM convention and guideline are provided. Optum360 Edge — Designed for all levels of expertise. Coding examples and case studies tackle coding concepts ranging from basic to advanced. Optum360 Edge — Illustrations. Both anatomical and disease/injury illustrations are provided to further enhance understanding. Optum360 Edge — Comprehensive index. Quickly identify all relevant coding examples and case studies contained in Determining the Diagnosis when researching correct coding of specific conditions and correct application of coding guidelines.